After the flights have landed and you have completed all the formalities at the Santa Cruz airport car hire counter, the staff will explain to you the way to the pick-up point where you will receive your rental car. The rental car pick-up station can vary from company to company. 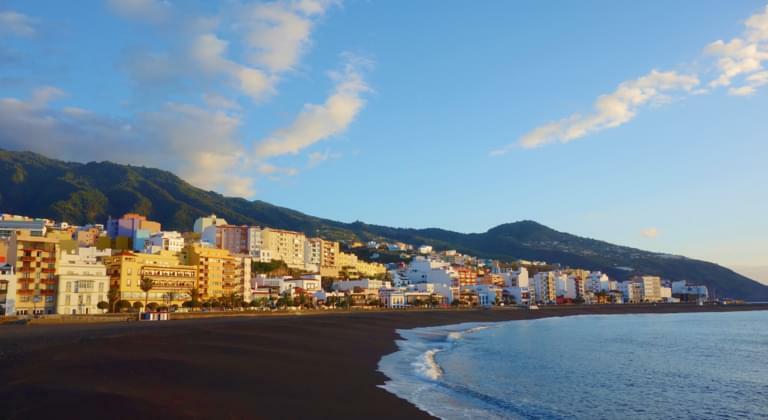 Go to the pick-up station and pick up your rental car, where you can explore Santa Cruz de la Palma in Spain immediately after your flight. A car trip to Los Cancajos is also worth the trip. Rent a car of your choice at a bargain price and get advice from the Driveboo Call Center. In addition, you can ask our competent advisors questions about booking a rental car at Santa Cruz de la Palma Airport in a live chat. You can reach the Old Town comfortably with your rental car. The splendour of ancient times has been clearly visible preserved here. Many of the churches, palaces and other houses are partly listed and built in Canarian style. They give the surroundings a unique flair, which you cannot escape. Continue with the rental car, which you could rent cheaply at the airport car rental to the other sights of the city. Especially in the morning Santa Cruz de la Palma, the island capital of La Palma in Spain, shows its most beautiful side. The Canary Islands houses are richly decorated and have wooden balconies. They offer a breathtakingly beautiful contrast to the mountain slopes, but also offer a charming contrast to the modern concrete residential buildings on the other side of Santa Cruz de la Palma. The historical part of the town is situated on the Avenida Maritima, which leads directly to the sea. Here you will find many historic houses, which are listed as historical monuments and have been converted into restaurants, bars or shops. A walk through the streets near the Avenida is also recommended, as you will have the opportunity to visit many old buildings. Until the early 1980s, Calle O' Daly was the main thoroughfare. Since then, however, it has been a pedestrian precinct and offers opportunities for shopping. In addition to boutiques, banks, bars, shops and other historic buildings are located here. Explore with your rental car Santa Cruz de la Palma and the surroundings of the island in Spain. Santa Cruz de la Palma Airport is located on the Atlantic coast, only 8 km from the island's capital. It serves as an important air traffic hub for the Canary Islands and is particularly important for tourism there. The airport code is SPC. Although it has two terminals, only the new building is currently used for air traffic. Approximately 810,000 passengers per year are handled here. At the same time, approximately 12,900 aircraft movements take place each year. The new terminal with its eight floors and the departure area on the top floor also offers its guests restaurants, bars, cafés, a duty-free shop, a kiosk and a souvenir shop. You can also book cheap flights with Binter. Of course there are other facilities at the airport SPC. The building itself consists of eight levels with an area of over 95,000 square metres. Take a seat in the cosy restaurant, stock up on all necessary goods at the kiosk or buy gifts for your loved ones and friends in the souvenir shop. If you travel with children, you can also use the children's play area, which has been designed for the youngest children. In the duty-free shop you can buy the usual products such as tobacco, cosmetics, perfume or spirits at reasonable prices. There is also a lost property office. In the pharmacy you can stock up on over-the-counter medicines and the like. At the airport you will also find lifts and barrier-free toilets. People with disabilities can use a free help service, which must be requested separately. Furthermore, you can surf the web for free via WLAN at Airport SPC for the first 15 minutes after landing the flights. Afterwards, the service is subject to a fee. To continue using it, you need to register. With your rental car from Santa Cruz de la Palma Airport Car Rental you can travel all over the island of Spain in a comfortable and flexible way. At Binter you get flights at reasonable prices. Santa Cruz de la Palma Airport is located on the east coast of the island and is regularly closed to strong westerly winds for safety reasons. Flights will then no longer be allowed to land because of dangerous air turbulences. It is therefore worthwhile for you to follow the weather conditions before your trip so that you can avoid any breakdowns. Once your flight has landed, you can rent a car at the car hire desk and explore the island in Spain. You can also book a cheap flight with Binter. Where are the luggage carousels at Santa Cruz Airport? The arrival area with a total of five baggage carousels is located at the middle level of the SPC airport. Depending on which flights land, you will be guided to a specific baggage carousel after the flight. Once you have received all your luggage, you can go to the car rental counter, where you can rent a car at a bargain price and pick it up at the pick-up point. Car Rental at SPC Airport - where are the counters? At Santa Cruz de la Palma airport, you can also rent a car at a car rental counter and pick it up at the company's pick-up point. The most important companies for car rental are represented at the terminal in the arrivals area. These include, for example, Hertz, Avis, Europcar or Cicar. Rent a car at Santa Cruz de la Palma airport and pick up your rental car at the pick-up point. However, it is advisable to reserve your rental car on the Internet before your flight at the car rental company of your choice. This saves you not only money, but also time and effort at the counter. Where is a petrol station at Santa Cruz de la Palma Airport? Once you have picked up your car at the pick-up point of your car rental company, it may be necessary to refuel your car, which you have rented at a discounted rate, in order to be able to explore the Spanish island after your flight. Immediately after leaving the car park in a southerly direction, follow the left-hand lane to the nearest petrol station, just a few kilometres from Santa Cruz de la Palma Airport. Book a cheap flight with Binter and combine your booking by renting a car on the Internet at the cheapest car hire company of your choice. However, please note that the company must also be located in Santa Cruz de la Palma. You will then receive your rental car at the pick-up point of the car rental service. Santa Cruz de la Palma Airport is conveniently located on the LP-205 and LP-138 expressways, and can be reached from the city centre in about 16 minutes by car. In the west of the island lies the village Los Llanos, which you can reach in about 30 minutes from the airport. Rent a cheap rental car with your car hire company and save money by booking cheap flights with Binter. If you are travelling on Spanish roads with your rental car, you should observe the prevailing traffic rules. An international driving licence is not required. However, keep to the maximum speed limits. The alcohol limit in Spain is 0.5 per mille. From a limit of 1.2 per mille upwards, high fines are imposed. Prison sentences of between three and six months are also possible if you exceed this limit. In addition, buckles are obligatory everywhere in Spain. If you drive unbuckled in a rental car, you will also face fines. From the airport SPC you can start with the rental car. First drive to your accommodation or start by visiting the various sights on your way to your accommodation. But also on the whole island there are a lot of things worth seeing that you shouldn't miss. Avenida Maritima is very popular with tourists. It is a wide road that leads directly by the sea and invites you to stroll or relax, because here you can listen to the sound of the sea or simply enjoy the beautiful view. Be careful with high waves, however, as the waves often even reach the quay wall and in the past have often caused many a tourist to get soaked. Book your rental car online before your flight and save a lot of money.